It is that time of year again! Monday is the start of my 3rd annual March Madness Music bracket. Two years ago I posted Música miércoles - bracket style based from this awesome post from Bethanie Drew. It was very low tech and drawn on my unused chalk board. Last year I posted our upgraded bracket with embedded videos in the slides & our Youtube playlist. it was so successful, that students begged for another bracket, so we did an April madness as well. (This was mostly because it was at the change of the trimester and I had a whole new group of students who wanted a chance to have a bracket. I only plan to do one this year, because I do not want it to get stale). 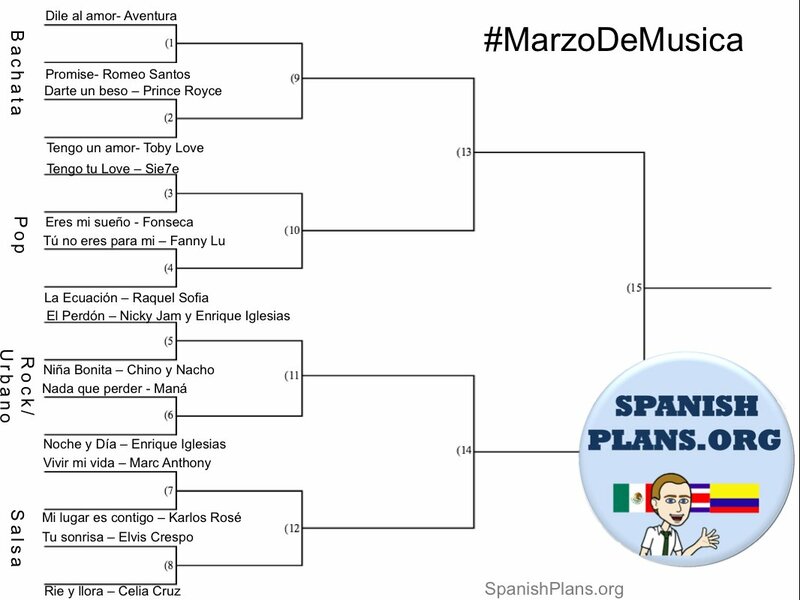 This year I once again wanted students to have more say in creating the bracket, so I created a quick Google Form for students to nominate potential songs in Spanish. I put the most requested ones together in an excel bracket chart and tried to give it some kind or organization. I ended up having four quadrants: current songs, old school songs (aka what I listened to in high school Spanish in the early 2000's:), past class favorites, and Sra's picks. I tried to have a variety of artists, but you can tell by the lack of genres that these students love reggaetón and Latin pop. We listen to a variety in class, but when given the choice of their favorites, you see a lot of the same types of music. If this is something you would like to do in class, you can download the whole unit here. It is updated to include 3 separate brackets! It includes an editable slideshow with embedded videos, bracket & bulletin board for each. If you already have it, make sure to download the new version!! For logistics, all classes will watch and vote for one pairing each day via google form. To keep it easy for a department of one, all classes will have the same bracket, and as a school decide who wins and moves on. This way on the giant bulletin board we can all follow along with who is winning. I plan to post the playlist, bracket and voting forms on Schoology, and as a class starter students will vote each day. We will probably start by watching them as a class, but once we have moved past round one, students will re-watch them on their own if needed and vote. I know many other teachers do something similar and each have their own twist. You could do the whole bracket in a couple days if needed, but I personally like to spread it out to give some life to a dreary time of year in Iowa. If you are doing something similar, please share your bracket in the comments & I will add them here! If you would like to talk music more, join me for #langchat at 7pm CST on Thursday. Be kind as I will be guest moderating and have really big shoes to fill! Does it matter if the students have heard some of the songs before, do you try to pick ones that are brand new? This year I let students request songs, so naturally most are ones they have heard before. Many previous year favorites are new to my Sp1 and junior high, but repeats that upper levels love. I try to add some new ones in, but this year most they have heard. My first year, they were mostly new. It all depend on how you want to use it. Either way they love it! How do you carry out the voting stage? I am looking forward to incorporating this into my sessions! !